Kernel smoothing is a flexible nonparametric curve estimation method that is applicable when parametric descriptions of the data are not sufficiently adequate. This book explores theory and methods of kernel smoothing in a variety of contexts, considering independent and correlated data e.g. with short-memory and long-memory correlations, as well as non-Gaussian data that are transformations of latent Gaussian processes. These types of data occur in many fields of research, e.g. the natural and the environmental sciences, and others. Nonparametric density estimation, nonparametric and semiparametric regression, trend and surface estimation in particular for time series and spatial data and other topics such as rapid change points, robustness etc. are introduced alongside a study of their theoretical properties and optimality issues, such as consistency and bandwidth selection. 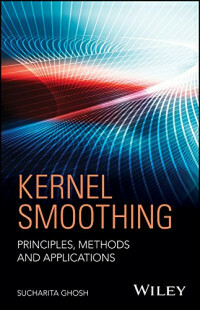 Addressing a variety of topics, Kernel Smoothing: Principles, Methods and Applications offers a user-friendly presentation of the mathematical content so that the reader can directly implement the formulas using any appropriate software. The overall aim of the book is to describe the methods and their theoretical backgrounds, while maintaining an analytically simple approach and including motivating examples—making it extremely useful in many sciences such as geophysics, climate research, forestry, ecology, and other natural and life sciences, as well as in finance, sociology, and engineering. Kernel Smoothing: Principles, Methods and Applications is a textbook for senior undergraduate and graduate students in statistics, as well as a reference book for applied statisticians and advanced researchers.